Volvo's S40 saloon and V40 estate range is built in the Netherlands, on the same production line as Mitsubishi's absolutely un-charismatic Carisma. This is because, deep down, they are all the same car. Volvo soon realised its models weren't up to scratch though, suffering from poor dynamics and ropey refinement, so updated the range in 2000. It's due to become obsolete in early 2004, with an altogether better new S40 saloon (see separate road test) going on sale at the beginning of the year, and the estate, to be called V50, following later in the spring/early summer. 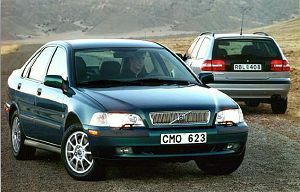 This series, however, will continue on sale well into mid-2004, up until the end of Volvo's contract with Mitsubishi. The early new S40s will come with the higher-powered engines only, so Volvo will continue to sell the lesser-powered versions of this range - 1.6, 1.8, 2.0 and 2.0D - as entry-level models, discontinuing the flawed, wild but strangely likeable T4 turbo. Expect these models to get progressively cheaper as the launch of the full new range gets closer, and don't be afraid to more or less name your price. Alongside Volvo's ultra-desirable 'waisted' range of cars, and the swish C70, the S40 and V40 are both looking dated now. They're still handsome, particularly since the last revision round, but also seem old-fashioned and, well, too ordinary alongside dramatic competitors. Would you choose one, going on looks alone, over a Mazda6? Thought not. Performance very much depends on which model you go for; there's plenty of disparity. Basic 1.6-litre and 1.8-litre variants are decidedly lacking in both power and manners, and the non-turbo 2.0-litre is also a touch gruff and gutless. Best go for the 1.8-litre GDI unit, which is great, or the 2.0-litre turbos in either standard or firey T4 format. Both are impressively pacy, particularly the T4 - which will happily melt a set of front tyres, should you turn the traction control off. There are two common-rail diesels too, which are also very good, if a little noisy in this installation. The driving position is good, if dominated by that cliff-like dashboard, and seat comfort is superb. Controls are well-placed and easy to manipulate, and its Japanese roots certainly shine through in the way it drives, for it's foolproof and simple - aided in no small part by dimensions which are tighter than its main rivals. Traditionally a Volvo strength, the S/V40 is basically a very safe car, scoring a fine 4-star result in the Euro-NCAP crash safety program. This is despite its basic age, which makes the result all the more impressive; thank a wealth of airbags and thorough development by Volvo engineers. Security is also good, though again limited by age; the car lacks some of the advanced features taken for granted on more modern models. It's looking cramped next to models such as the new Mondeo and Mazda6, which is another sign of its age. In reality, it feels more cramped in the front than it actually is, due to the imposing black dash, though things really are tight in the rear, in all directions. The S40's boot also lacks the flexibility of hatchback rivals, while the V40 is not really a true estate; it's not as accommodating as Volvo load-luggers traditionally are. Fuel efficiency is generally fine, particularly for the diesels, while the high-performance T4 model produces a lot of power for a 32mpg average. Insurance is less impressive for that model though; it's rated at Group 16. Don't even think of buying at official list price, either - depreciation is fearsome for all variants. 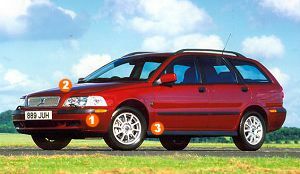 Without the appeal of other Volvos, these models just can't hold onto their value. Very impressive in the front. The seats are large, invariably heated and supremely comfortable, while the dated but not-unattractive dash is a delight to use. It's less comfortable in the rear, though decent equipment levels and pleasant interior trims are some compensation. Ride quality is also reasonable, though drops significantly should you choose sportier suspension set-ups. Most models are competent but dull. Handling lacks precision but does everything you could ask, while the steering is OK without overloading you with information. Smaller engines are gutless too, diesels punchy but not exemplars of smoothness, making the 2.0-litre turbo petrols the best bet for real thrills. But, while the standard version is nicely balanced, T4 models are very ragged and lively - they go fast, but with little finesse. Whether this is fun or not is entirely down to personal preference. It looks good, is easy to use and sounds great. Bass is punchy, treble well-defined, and a CD on all variants is very welcome. You won't find many better units at this price. As it gets older, Volvo adds more equipment to make it more attractive to buyers. This means even the most basic 1.6-litre S or V40 is keenly-equipped, with more expensive models pleasing too. The Volvo badge also makes you feel a bit more 'special' even though reality doesn't live up to this impression. As mentioned, severe depreciation shows the S and V40's limited appeal on the used market. The V40 performs better, thanks to its more desirable estate layout, but even it can't match Audi or BMW levels. On the other hand, this means that if you can wait a few years, you'll have a bargain on your hands. Just make sure you get a hefty discount if buying new.